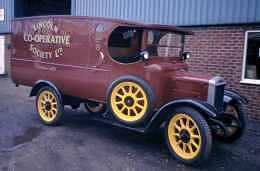 Morris Commercial was a company separate to Morris Motors, but also owned by William Morris, established in in 1924 with the purchase of the assets of E.G. Wrigley and Company which had gone into receivership in 1923. Morris Commercial was established at Foundry lane, Soho, Birmingham. This van has a Middlesex registration and we know very little about its past history. In recent years it was purchased by the Lincolnshire Co-operative Society for promotional use. If anyone knows any more of its past history, we would be glad to hear from you.